This flow demonstrates how to use the REST API to run a manual test. The manual test run is a subtype of the runs aggregate resource collection. The manual test run can also be accessed in the manual_runs resource collection. Manual test runs are associated with their respective tests. Let's create the REST API call for creating a manual test run step-by-step. Generally, we create manual tests with their phase set to New. So first let's check the phases entity to see which ID corresponds to the New phase for manual tests. We now POST a manual test whose name is MyManualTest with the New phase. In response, the manual test is created with ID 1079. We now update the newly-created MyManualTest (with ID 1079) by adding test steps to it using the PUT operation. Our manual test has three steps plus one validation step. Scripts are added using the tests resource collection, and not the manual_tests resource collection. Test scripts support versioning. So when we update the test with its steps, we can specify a comment and a revision type for this version of test steps. In this flow, the version has blank comment, and its revision type is considered minor. Revision types can be either Major or Minor. The steps are added to the manual test. The name and ID of the test we are "running." The native status we want to assign to the run. 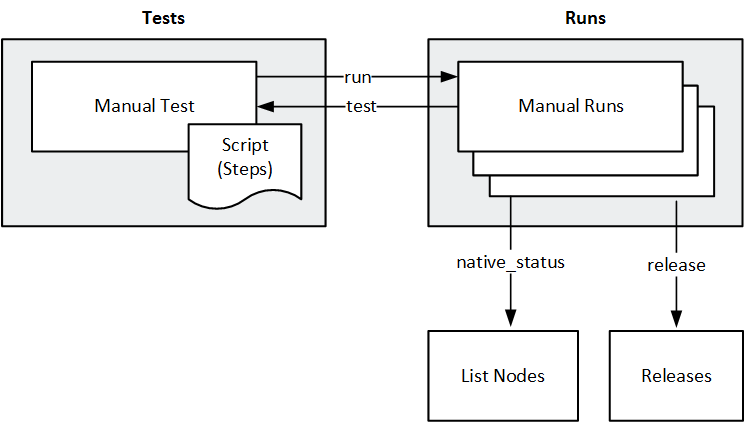 Statuses are accessed in the list_node resource collection. In this flow, we will assign status 1091, which corresponds to list_node.run_native_status.failed. The release associated with the run. The test run is created with ID 1195.